<< Use the links on the left to view our products by Category. When it comes to giving your dog a treat, you want something your best friend will enjoy. But you also want a dog treat that is healthy. At Tail Bangers, you’ll find a selection of wholesale all natural dog treats for your dog or puppy that are both healthy and flavorful. We strive to deliver the best possible dog treats for our customers. 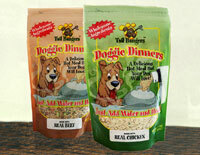 We offer a variety of all-natural dog bones, dog cookies, and other pet treats that come in gourmet flavors and shapes. Each dog treat is homemade with all-natural ingredients and care. These all-natural dog treats are only sold in these retail stores, but can be ordered in bulk through our website. Please fill out the wholesale inquiry if you're interested our wholesale line and in becoming a retailer.